Click here to order ColoradoStrong® merchandise! 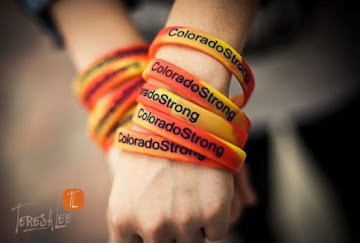 ColoradoStrong® is a 501(c)(3) non-profit charity started by a local teen. This idea all started the night of mass chaos and panic in the city of Colorado Springs on Tuesday, June 26, 2012. As people were getting evacuated out of their homes (including our family, my friends and loved ones) and news was spreading of fires finally reaching structures, the slogan rose from the smoke and began to trend on Twitter as the Colorado Springs community reached out to one another for support and comfort. That day, the smoke began pouring over the mountains thicker and faster than ever. I had gone to Denver earlier in the day, with no evacuations in place at our home, thinking the situation wasn't immediately dangerous. A few hours later, my parents called me to let me know we had gone from pre-evacuation to mandatory evacuation, along with the entire communities of Peregrine and Mountain Shadows. The fire had unexpectedly gone into neighborhoods and began burning structures. As I rushed back down to the Springs, the sight I could see all the way from Monument was far worse than the news my parents had given me just a couple of hours before. I began to see a bright red blaze and as I came closer to the Springs, could make out a stream of houses all burning and new houses catching fire by the minute. Throughout the night, I had received calls from friends, either checking to see if I was safe or to notify me that their houses or our other friends' houses had burned down. Although I felt devastated and heartbroken that night, it was hard not to keep hope and stay strong as the entire city of Colorado Springs, and even people out of state, had been posting encouraging, supportive and fighting words left and right. That was when the true meaning of "ColoradoStrong" had finally hit me. Everyone was coming together as a community, rather than just citizens of the city or state. We were rising above the devastation, pushing for hope and giving others assurance, even when some were well aware that their homes were long gone. We were opening our homes and/or providing supplies to evacuees, volunteering to take in and/or provide for rescued animals, giving supplies and words of encouragement and gratitude to our incredible firefighters, other first responders, and brainstorming new ways to fundraise and contribute to a cause that was very personal to all of us. Finally, when the fire had finally moved outside of city limits, we were giving people in those areas our words of hope and love once again. As a Colorado native, it has been truly difficult and life-changing to watch what makes Colorado so beautiful, burn. I see the aftermath outside our windows every day. From the Waldo Canyon fire to the High Park and Black Forest fires and every wildfire our beautiful state has endured, I am so proud of the men and women risking their lives to fight these fires tirelessly and relentlessly every day to protect us. Now, it's our turn to help out and give back through our non-profit, ColoradoStrong®. Together, we are ALL ColoradoStrong. We appreciate that very much! Good work! Love the website. Prayers to you all. Thank you so much, Lyndia! I love the idea of wristbands. What about T-Shirts? I would love to have a Colorado Strong T-Shirt. Right now, we aren't personally making them but have close contacts with people that are. We'd be happy to get their info to you. Just message us via Facebook or Twitter. We can be found under ColoradoStrong (one word) at both places. Thanks so much! Why can't I get to the web site to order? You are on the site. Just click on where is says "order here" on the home page. ORDER YOUR COLORADOSTRONG® MERCHANDISE HERE! CLICK THE PICTURE BELOW TO ORDER NOW! Here are the bands! Red and yellow swirl to depict the fire and blue writing to represent all the colors in the Colorado flag!